It’s honestly hard to stomach, but for the second time in two years the Chicago Bulls find themselves Rose-less. Derrick Rose has been ruled out for the remainder of the season after having surgery to repair the torn medial meniscus in his right knee Monday morning. The basketball odds are not in the Bulls’ favor and so a serious case of the Bulls Blues has taken over the city of Chicago as we embark on #theReturnPart2. With the confirmation of the devastating DRose news comes an overwhelming sea of questions. Will Rose ever be the same? What are the Bulls going to do? Can the season still be salvaged? Will we ever see a NBA Championship in Chicago during the Rose era? Let’s see if we can get some of these answered. The Bulls’ star was in good spirits after surgery and the organization expects a full recovery from their MVP. Rose opted to have the meniscus repaired in his knee rather than having it removed all together. The recovery time for removing the meniscus would have been much quicker, but repairing it allows for more longevity in Rose’s career. The rehabbing process takes at least six months. There is one silver lining to the Rose injury saga, it could have been worse. Most feared the worst Saturday afternoon while refreshing their news feeds to get the latest DRose news, he could have torn the ACL in his right knee. Which ultimately could have been career ending. Confidence and trust will play a major factor in Rose’s recovery. We all watched him struggle to find his groove this season after sitting out for an entire year rehabbing his ACL. In the last three seasons, Rose has only played in 50 games and now he’ll have two reconstructed knees. Rose is a super humble dude, but it’s going to take some mega-mindpower to get back into his pre-injury form. All postseason hopes are not lost of our mighty Bulls. Don’t get me wrong, the Bulls are absolutely better off with Rose on the court – the entire league is actually – but they still have enough talent to take them into the playoffs without the 2010-2011 MVP. With Rose active the Bulls are a title contender. Without Rose the team could make a playoff run, but are unlikely to beat the Miami Heat or the Indiana Pacers in a 7 game series. HOWEVER the Heat are one Dwyane Wade injury away from trouble and the Pacers still struggle on offense down the stretch. Los Bulls have been down this road before. They’ve managed a winning season without their star point guard. The key to success will be a healthy Joakim Noah, Luol Deng, Jimmy Butler and Taj Gibson. Offseason pickup Mike Dunleavy, a seasoned vet, will need to get going and be a consistent scorer. Luol Deng trade rumors have begun to spiral. Without Rose healthy the team is now looking toward the future rather than the present season. Deng is a two-time All-Star forward who’s expecting some serious cash when he becomes a free agent at the end of this season. That being said, the Bulls are already paying the luxury tax for being over the salary cap threshold. They’re looking to lower their financial load and unfortunately the team would get the most in return for a Deng trade. Read more of my Bulls coverage at SportsDivasInc.com via Injury ALERT: Rose Officially Ruled Out for the Season | SportsDivas Inc..
What’s in store for Urlacher in 2012? The Chicago Bears were full of smooth moves this off season making improvements to the team’s offense, but it looks like things are a little shaky on the defensive end coming into the 2012-2013 season. Eight-time Pro Bowl selection Brian Urlacher, the heart and soul of the Chicago Bears defense, is still suffering from a knee injury he faced last season. After all the excitement from the offensive Cutler-Marshall duo wears off, should Bears fans be a little worried? Last Tuesday Urlacher had arthroscopic surgery on his left knee – AKA a left knee scope. Now we’ve learned that Urlacher didn’t necessarily wait until the last minute to relieve his knee pain. According to a Chicago Tribune report, Urlacher traveled to Europe earlier this offseason for a “non-invasive treatment” on his left knee. This treatment is known as Regenokine injection therapy and has been utilized by other athletes such a Kobe Bryant and Alex Rodriguez. What’s the catch you ask? The procedure has not been approved by the Food and Drug Administration so it’s not “up for discussion” just yet. The middle linebacker and the Bears are still targeting the Sept. 9 opener against Indianapolis for his return, but is this the best idea? 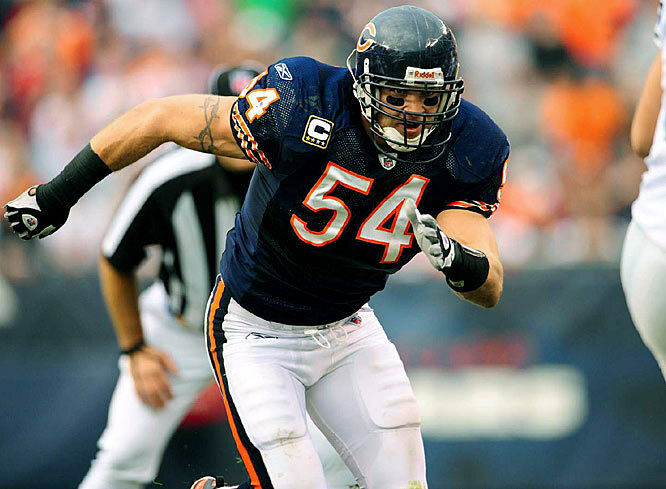 The Bears organization keeps emphasizing the importance of the first game of the year – why rush Urlacher back on the field before he’s absolutely ready (especially when the Bears should be able to beat the Colts without their Pro Bowl Linebacker)? Does Lovie Smith’s defense only work if all four Pro Bowl defensive players stay healthy and on the field? Right now, fill-in middle linebacker Nick Roach can play the position capably. The key to the Bear’s success defensively will highly be influenced by the pass rush. In the preseason game against the Redskins we saw an example of some sultry pass rushing when Israel Idonije forced Robert Griffin III to fumble and Julius Peppers recovered the ball. If the big men up front get a ferocious rhythm going, our defense can survive while Urlacher recovers. Knee injuries are no walk in the park and should always be taken seriously. Ultimately, it’s most important that Chicago brings Urlacher back slowly and the team tries to overcome his absence in the meantime. We gotta be cautious! We need the big man for some Bears playoff wins!